So here we have a square made from 4 points (mind blowing!). To find the location of V0 from the other points we can use half the sum of V1 and V3 then add this unknown vector d0 (delta). 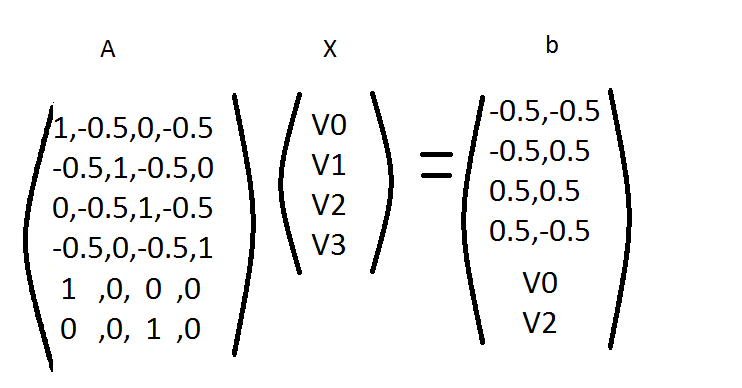 We can calculate this unknown by simply rearranging the equation just like in Fig 1. Now lets get a bit more crazy and represent all these points in implicit matrix form. From this form you are now ready to create some deformation! You do this by adding these things called “handles” or “anchors” to our matrix. Say if we want V0 and V2 to be our handles this is how it would look. Now we have the basis of our laplacian mesh editing! You can deform simple shapes to your hearts desire! But this is by no means a complete. The way we create our matrix A or our “laplace matrix” only currently works for very uniform geometry. For any complicated shapes we will have to calculate this another way. Sadly I dont know that yet 😦 but keep updated with my posts and one day… just maybe… I will! Anyway here’s a pretty demo!